A quick glance at the map of the inland waterways published by the Central Commission for the Navigation of the Rhine (CCNR) in their 2016 Marketing Report is enough to make any skipper with a cargo barge less than 85m long fear that their future is on the line. Many of the waterways they regularly work are simply airbrushed out of the picture. Unbelievably there appear to be no waterways in Holland to the north and east of Rotterdam and Amsterdam. And the French waterway network is unrecognisable with a large hole on the map where the Freycinet canals still do a useful job linking the Seine, Moselle and Rhine to the Saône and Rhône. 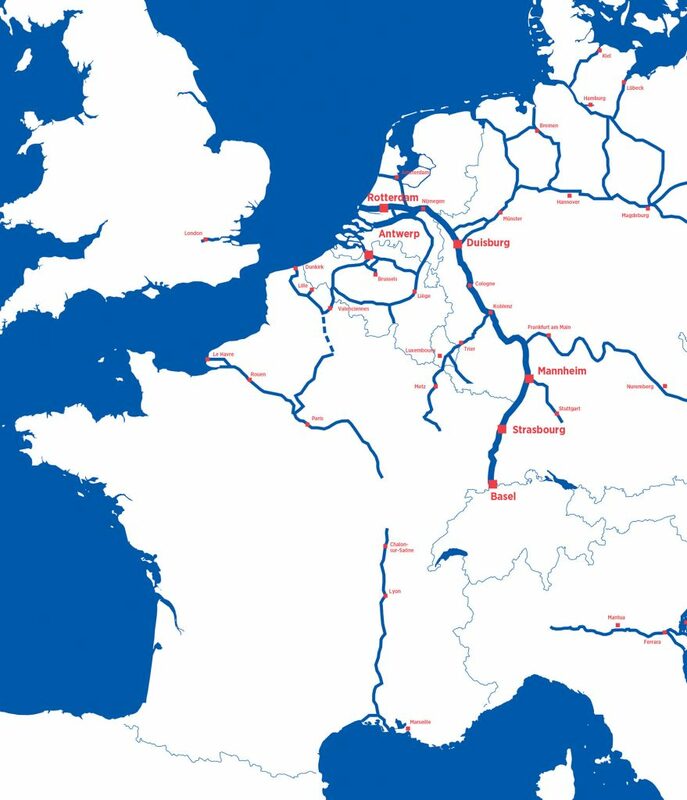 One of the CCNR’s schematic maps of available through routes, ironically titled ‘Infrastructure & Connectivity’, shows the Rhône out on a limb, totally unconnected with northern European waterways. The CCNR maps appeared in the year that EC Directive 1629/2016 was adopted. This sets out the technical standards to be met by all cargo barges in the European member states. National governments have until October 2018 to pass the necessary legislation to fully implement the Directive. The crunch is coming! In March, the Dutch skippers’ union ASV which represents many of the ‘small’ barge owners (350 to over 1,000 tonnes!) launched a petition asking their government to ensure their future. If not, they warn, all barges up to 85m long could be out of business by 2025. Instead of achieving cleaner, greener and safer transport, there could be 74,000 extra trucks a week on already crowded Dutch roads. This conflicts with the EU’s stated objective of shifting 30% of transport from the roads to rail and water by 2030, rising to 50% by 2050. One of the problems faced by boatmen is finding finance to cover the heavy costs of bringing their barges up to the stringent technical requirements drawn up by the Comité Européen pour l’Elaboration des Standards dans le Domaine de Navigation Intérieure (CESNI), a committee set up by the CCNR to bring together experts and representatives of international organizations. One of the experts was Hans Kouwenberg who carried cargoes north-south with a 38m barge before setting up a navigation software company and becoming a consultant to the Rijkswaterstaat, the Dutch navigation authority. The bureaucratic mind, he says, just does not understand that it is the dimensions of locks and bridges that dictate the size of the smaller barges and explain their continued employment. It is thus wrong to write them off as superannuated vessels operated by old-fashioned folk too stubborn to innovate. They are useful and their clients want their service. Nor does the penny drop that if barges up to 85 metres in length are consigned to the scrapyard one third of Holland’s 5000 kilometers of currently used commercial waterways will no longer be available for transport as they simply cannot accommodate vessels over 1000 tonnes. Worse, in Europe as a whole it is a fact that waterways accessible to 1500-tonne barges amount to around a quarter of the total length of waterways in current use, thus three-quarters of the network could be at risk. And since the new rules and restrictions are also to be applied to recreational craft, Hans is so pessimistic about the impact on the waterways in France that he no longer contemplates buying a boat for retirement cruising. The ASV petition ‘Geef de binnenvaart toekomst en voorkom 74,000 extra trucks, files en CO2 outstoot’ (Give inland shipping a future and prevent 74 000 extra trucks, traffic jams and CO2 emissions) picked up 300 signatures in the first 15 hours and numbers are growing. The petition closes at the end of June.